Your bowel movement habits are a great way to asses your digestive and overall health. From frequency to stool appearance, every little detail says something about how healthy you are, how well you eat to how active you are. Different stool colors indicate changing eating habits or pathologies. Various smells may reveal poor dietary choices or underlying conditions. Stools shape and consistency can tell you if you’ve been drinking enough water or not or if you have been too inactive for too long. Bowel movement characteristics like stool size, shape, color, odor, consistency or texture as well as usual bowel movement frequency are all telling signs of your current health status and dietary choices. 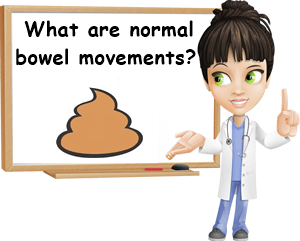 What are normal bowel movements like? It’s common to have bowel movements once a day, when waking up in the morning or 3 times a day, after every main meal. It’s also considered healthy to have only 3 bowel movements per week. It’s normal to have brown stools as well as to get green stools if you eat lots of spinach or parsley, reddish stools if you eat lots of beets or deep yellow stools if you eat only vegetables for a couple of days, although other stool colors except brown should only be temporary. It’s normal to have long stools, solid and well-formed, with a soft surface, but passing such stools in succession during one bowel movement is also okay. There are some general guidelines when it comes to what are considered to be healthy bowel movements, but know that’s it’s also okay if your bowel movement habits and stool appearance differ slightly from those of the majority. As long as they maintain some semblance of similarity, you may consider yourself within the normal range. In a way, the most important piece of information you can take with you from this is that normal is what’s normal for you and it’s okay if your bowel movements change temporarily in response to diet and lifestyle. 1) Frequency. Bowel movement frequency is variable. It’s common to have 1 bowel movement a day, upon waking up in the morning or at any time during the day. It’s just as common to have 3 bowel movements per day, after every main meal or one in the morning when waking up and the rest after eating more significant meals. Even 3 bowel movements per week is standard for some people, but less than 3 is considered a sign of constipation and measures should be taken to increase stools frequency. How many bowel movements a day or a week you have really depends on your individual transit time. Experts say it usually takes food anywhere from 48 to 72 hours to pass through the digestive tract and be eliminated. Some people may have a fast intestinal transit which means they can have bowel movements as frequent as once a day, twice, three times or even four times a day. As long as stools exit easily and have the right consistency and color, they are no reason for concern. Other people go to the bathroom every two days, maybe 3 times a week. As long as they don’t show signs of constipation, they are within normal range too. Because daily bowel movements are not necessary. 2) Schedule. Allow me to start by saying that every person has their own bowel movements schedule. Depending on their eating habits, working hours, exercising possibilities and other factors, an individual regularity usually develops, integrated within their daily routine. As long as bowel movements are regular and relatively frequent (no less than 3 per week), you are within the normal range, irrespective of when exactly you have them. This being said, usually the best time to have a bowel movement for a morning person is in the morning, soon after waking up or after eating breakfast. If your transit is on point, the need to have a bowel movement should occur at the exact time every day, like clockwork, with or without coffee. If you usually have more than one bowel movement a day, it could be after eating, after every meal or after exercising, if you have an exercise routine in place. If you are a night person, your bowel habits could be entirely different, but in any case revolving around how you structure your active hours. For example, if you wake up at noon, that’s when you could have your first bowel movement. Or have one after eating throughout the day. The more regular your active hours, especially eating and sleeping, the more regular your bowel movement schedule. The more disorganized you are, especially with eating hours and sleeping, the more irregular your bowel habits. 3) Bowel movements shape and texture. Relatively long or elongated stools, shaped like a snake or sausage, with a smooth, soft surface are ideal. If too long, they may break into pieces, but are usually eliminated in succession during one bowel movement. Cracks on the surface indicate that you’ve either had too little water or that you might have been holding your bowel movements in (which causes the colon to reabsorb some of the water in the stool). But it’s still okay. Lumpy stools shaped like a snake occur as a result of mild constipation. Separate, hard lumps of stool or stools shaped like pebbles or marbles indicate serious constipation caused by dehydration and lack of fiber. Soft blobs of stool with clear edges may be a sign of too little or too much fiber. Mushy stools with ragged edges indicate diarrhea, either because of too much fiber or infection like a stomach virus or stomach bug. If the stools are visibly greasy or stick to the side of the toilet bowl, then they may be caused by eating too many fats. Lastly, mushy, shapeless stools and liquid stools indicate diarrhea. General stool forms or shapes are grouped in what is known as the Bristol stool chart, or Bristol stool form scale. 4) Bowel movements size. Stool size is variable and essentially determined by how much or how little we eat. Soft, smooth stools shaped like a snake tend to be relatively more voluminous because they are a result of adequate nutrition. Stools with cracks on the surface or lumpy stools can also be somewhat voluminous. Pebble, marble or nut-like stools are, well, smaller in size because constipation causes a reduction in size. Soft blobs, mushy stools and liquid stools do not appear voluminous. However, a more severe, usually infectious diarrhea can lead to significant volumes of stool material to be eliminated at once. Having one bowel movement a day or three per week can result in more voluminous stools, whereas three or more bowel movements a day may not be as large. The amount of fiber you eat (and water) can also contribute to more or less voluminous stools. As for how much bowel movements weigh, this depends on how regular you are, what and how much you eat and other factors. However, look out for pencil-thin stools. These are not normal and may indicate an obstruction somewhere along the gastrointestinal tract, presumably caused by a tumor. Usually, if you eat very little, you have less frequent, smaller bowel movements. But bowel movements shaped like a pencil (long and thin stools) are unusual and should be investigated by a medical professional. 5) Bowel movements color. Typical, healthy bowel movement color is brown, light, medium or dark brown. It’s important for stools not to have any red undertones (red indicates bleeding). Green, red and black stools are considered unusual most of the time because they can be caused by pancreas or liver problems or bleeding. Green stools are considered normal only if you’ve eaten spinach, parsley or other green foods. Red stools are expected to occur if you’ve eaten beets or other strongly pigmented red foods. Black stools are fine only if you’ve had lots of chocolate, taken iron supplements or charcoal-based supplements or medication. Green, red and black bowel movements should only be occasional occurrences and occur temporarily. White, grey, light yellow or clay-colored stools are abnormal, but can sometimes be caused by certain medication. In any case, if you notice your bowel movements becoming discolored, see your doctor as soon as possible. Orange stools are unusual, but can be caused by eating lots of foods rich in carotenes like orange carrots, pumpkin or sweet potatoes. White spots or dots in brown stool can be either intestinal parasites or parasites eggs or food fragments like almonds fragments (see article on Worms and Intestinal Parasites). Stools with two different colors are normal if those colors are either dark brown and light brown, fused together. Sometimes you may get a dark or medium brown (delayed transit, slight constipation) followed by an amber or yellow brown stool (from eating mostly vegetables). For more information on bowel movements color, read the article Stools Colors: What They Mean. 6) Bowel movements odor. Stools will have some odor to them. And the intensity of said odor may change depending on what you eat. For example, most stools have a relatively tolerable smell most of the time. Eating foods like dried beans, too much garlic, onions, too many eggs and animal products in general may cause stools to smell worse than usual until you’ve passed those smelly foods. As long as this is temporary, occurring once or twice and in response to certain foods, there is no reason to worry. But if you notice your stools taking on a particularly bad odor or becoming odorless, it is important to make an appointment with your doctor as soon as possible. The causes of bad-smelling stools may range from bacterial or viral infections (gastroenteritis), parasitic infections (example: giardia infection) to gut flora imbalances, ulcerative colitis, Crohn’s disease, colon cancer and others. Conclusion. What are normal bowel movements for one person may be unusual bowel movements for another. When it comes to determining what are considered to be normal bowel movements, there is room for some variation. For example, it’s healthy to go to the bathroom after every meal and only three times a week. Similarly, it’s not that unusual for stools to change color, odor or consistency temporarily, in response to dietary changes. However, if you experience sudden, inexplicable and upsetting changes in bowel habits and normal stool appearance, repeated or continual, it is advised to make an appointment with your doctor. What is the best way to change the time you have a bowel movement? A few weeks ago I had a severe bought of diarrhea in the very early hours of the a.m. I am still suffering with loose stools beginning 4:30 in the morning, about 3 visits to the bathroom every 20 minutes or so. I am gonna try the B.R.A.T. diet and I have appointment with Dr., but in the meantime I would like to sleep with out being woken by the urgent need to poop! Hi, Robin. I am so sorry to hear about this. From my experience, the best way to change the time you have a bowel movement and essentially regulate transit time is to eat at the same time everyday and keep to a sleeping schedule. It helps to eat mostly cooked meals and have a proportionate intake of animal and plant-based foods. But since what you are dealing with is not what normal bowel movements look like for you, it’s important to manage symptoms until you see a doctor and get a diagnosis and treatment. The best thing you can do at this point, until you can see a doctor, is start the BRAT diet. Whether your diarrhea is infectious or not, this diet should help bind stools and maybe reduce some of the bowel movement frequency. Focus on absorbent foods like plain, white rice, white bread and toast made from it or plain, white pasta. Crackers, bagels, a bit of plain, boiled chicken meat or some hard boiled eggs can help too. The water in which you boil the rice is good for diarrhea and really helps bind stools. Although it doesn’t taste good. Peppermint tea also helps a lot. You can read more about the diet in my article What to Eat When You Have Diarrhea. The next best thing is seeing a doctor. It is possible this is an infectious diarrhea caused by bacteria or viruses (bacterial or viral gastroenteritis) or an intestinal parasite. It’s also possible it’s a stress-related issue. It’s actually not that uncommon for stress, anxiety to cause diarrhea and constipation. Too much fiber in your diet is another possible cause. Or an intolerance to a certain food or food group. Since it’s been going on for several weeks now, it could be an inflammatory bowel condition acting up. Write down all the symptoms you’ve been experiencing since the diarrhea started and tell your doctor. It can help a lot. 1) How loose the stools are (semi-solid or liquid). And are the morning stools the same consistency and frequency as those from the second part of the day? 2) What color are the stools: brown, deep yellow, green, red, discolored or black? Try to observe if there are red streaks because it may be a sign of presence of blood in stools. 3) Did you go on a trip recently, especially out of the country? 4) Did you change your diet, like change the water you’ve been drinking or introduced a new food? 5) Have you been experiencing nausea, vomiting sensation, fever or abdominal cramps? 6) Have you experienced bad breath, headaches, itching or any unusual symptom? All of this information can help with your diagnosis. Also remember to drink plenty of water because diarrhea dehydrates. Sparkling water that is naturally higher in potassium, magnesium, sodium and calcium can really help hydrate the body and replenish lost electrolytes. Avoid raw foods, especially fruits with skin (too much fiber), lettuce (it can house intestinal parasites or bacteria) and raw fish products (sushi) and keep things simple by eating plain boiled foods. The emphasis should be on absorbent foods, boiled chicken meat and small amounts of vegetables like boiled carrots or potatoes. Hope this helps and if you have any more questions that I can help with, I am happy to do so. Wishing you lots of health, Robin!